With winter at our doorstep and just hours before leaving office, outgoing European Commission President, José Manuel Barroso, announced a last minute deal to keep Ukraine and Europe warm this winter and give assurances to Gazprom that Ukraine will be able to pay its debts of $3.1 billion and make upfront payments for the 4 billion cubic meters of gas ($1.5 billion) to be supplied until March 2015. Ukraine now also feels comfortable that Russia will deliver on its commitments. Financing will come from the current IMF programs and other sources. The gas supplies to Ukraine had been cut since June, following deteriorating relations between the two countries. Meanwhile the tension between Europe and Russia was increasing and fears that Russia would cut gas supplies like it did in 2006 and 2009 resurfaced. 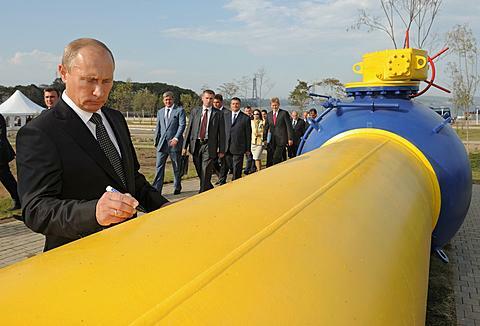 What aggravated Russia most was the re-export of Russian gas from Poland, Hungary and Slovakia to Ukraine. Retaliation through lower supplies to these highly dependent central-European states heightened the crisis. The deal implies a $378 per cubic meter rate price, far below the original Russian asking price of $485. Similarly, Poland managed to renegotiate its rates with Gazprom in 2012 with a 15% reduction on a price of around $550, the second highest in Europe at the time (after Macedonia). The recent reduction in the price of oil may have played in favor of Ukraine and Europe. While Russia was counting on oil at $100 a barrel for its 2015-2017 budget, the recent drop to $80 and expectations that it may fall to $70 in the coming months has severe implications for Russian finances and economy. The deal with Ukraine and the EU provides much needed stability for the coming months. Europe depends on Russia for 30% of its gas supplies. In Ukraine this dependence represents 40% of its entire energy consumption. But Ukraine is one of the least efficient countries in terms of its energy use and it is promoting energy waste through misguided fuel subsidies representing 7.5% of its GDP. With an energy intensity that is twice that of Russia and 10 times the OECD average, the IMF is correct in requiring a major energy reform to reduce energy waste as part of its bailout. Similarly, the EU is looking at improving energy security by implementing energy efficiency policies that would result in 40% savings by 2030, with equivalent reductions in gas imports. These measures could save Europe up to €549 billion between 2011 and 2030 according to the Commission. This entry was posted in Energy efficiency, energy security and tagged energy efficiency, energy intensity, energy security, EU, EU commission, oil, poland, russia, russian gas, ukraine by adamkoniuszewski. Bookmark the permalink.